FIND YOUR STATE CHAPTER - and YOUR PEOPLE! Looking to connect with other forest and nature schools in your state? Get involved with your ERAFANS state chapter! You can attend a chapter meeting anytime, and they are always FREE to attend (whether you are a contributing member or not). If you'd like more information, contact Simona and Christy at statechapters@erafans.org. Each state's forest and nature school chapter meets 3-4 times per year. Participating chapter members host rotating meetings at their schools and parks. Often, one of those meetings coincides with an outdoor teacher retreat or our annual Natural Wonder Summit. Chapter meetings offer opportunities to build on one another's experiences by sharing approaches to nature-based curriculum, emergent outdoor learning, and deeper nature connection. Because the meeting locations rotate, meetings also provide opportunities to see a range of learning environments, both indoors and out. Given the pace of many schools, reflection can be a hurried or absent aspect of our work. Chapter meetings provide opportunities for educators and administrators to engage in reflection about the children, families, teachers, and environments where they teach. This has implications for program evaluation, teacher professional development needs, and authentic assessment of children's growth, etc. We encourage the cross-pollination of ideas. Chapter meetings provide a platform for sharing, collaborating, and kindling ideas among educators and our respective organizations. We have greater impact when we work together, and chapter meetings provide space and time to nurture this collaboration. 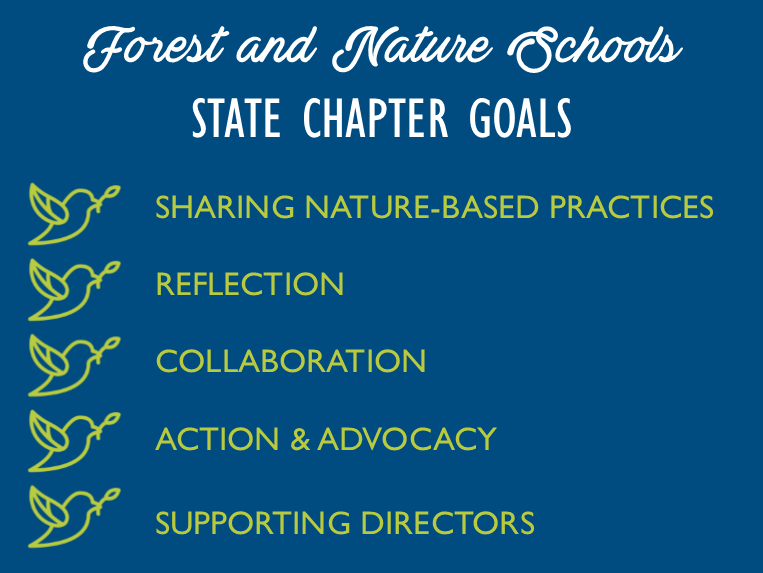 Chapters can identify projects that affect change at local and state levels to support nature-based education initiatives. ERAFANS provides a backbone for these initiatives to provide greater access, equity, and inclusion in nature-based education. As increasing numbers of nature-based programs take flight, chapters meetings are an ideal place to share program policies and best practices. Directors and administrators have limited resources and very specific needs, so chapter meetings can provide a sounding board where experienced directors and emerging ones meet. If your state still needs organizers, let us know if you want to lead the way! We have all the tools you need to get started and help support your grassroots efforts. Contact our state chapter initiative leaders, Simona Lederman and Christy Zolty if you're ready to lead the charge! NOTE: Affiliate networks are also forming with the Natural Start Alliance in collaboration with ERAFANS and several other regional associations that support nature-based educators.